Pier House Webcam. Live view overlooking The Pap of Glencoe, Scotland. 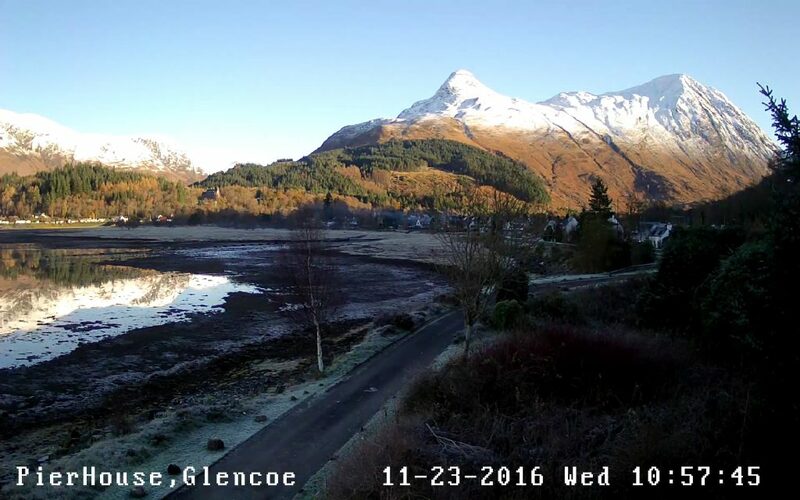 Live View: Pier House Webcam displays the view looking East towards the Pap of Glencoe. Pier House, Glencoe, offers contemporary en-suite B&B accommodation on the shore of Loch Leven. We are situated in a magnificent loch side setting overlooking the Pap of Glencoe and approximately 5 minutes walk from Glencoe village. On the left of the image is Invercoe and Loch Leven at mid-tide. The mountain on the right is Sgorr nam Fiannaidh (987m) which terminates Glencoe’s famous Aonach Eagach knife edge ridge. Looking East towards The Pap of Glencoe.